I think the C3V's thinking, if I remember correctly, was that people should freely use proxies, but it really wasn't up to the C3V to instruct people on how/whether to do so. Local tournament directors, such as myself, could allow reasonable proxies in competitive play. I could be misremembering, but that's pretty much how I feel about it. You don't have the Gnids? It's fine with me if you use Nagrubs at my tournaments. Yeah, I'm fine with that too, and it's allowed at our tourneys too. Might I suggest the following figure as an alternate? Says she's 2 inches tall though. Yuan-Ti Swiftscale is 3 inches tall, but that's due to the sword in her raised arm. So they should have the same head height. I'll buy one to check, unless someone has one. Thanks for reminding me about the Tatzlwyrm, Kinseth! A Suggestion for SoV, considering availability of figures these days. Perhaps allowing players to have Figure B as an alternative incase someone can't by Figure A. I believe this was done for Quahon. Sounds like a great idea! I believe C3G did something like this once or twice (the Sentinels specifically come to mind...). What if a few scapers got together and playtested units for the other four figures in the box. And kept it up until the made it through the SoV. I like the tatzlwyrm but it seems too thematically different from the rest of the design. That would be a cool idea. EDIT: Yeah, I would have to rework the thematics/powers to fit the tatzlwyrm. Maybe even rename. The tatzlwyrm doesn't really look like a viper to me. Have you looked more into the availability of the original mini? I haven't the chance yet to go over all her numbers thoroughly. Filler heroes are nice to have, and it's also nice to see the trope of the blind assassin make a Heroscape appearance. A hero like this, with a low price point and no strong synergies, either needs to fit into a specific role or work as cleanup filler. Pygar is the latter, with no tricks other than a potent offensive and defensive ability. Guilty and Eldgrim seem like good comparisons, but that's really not the case. Guilty is a long range run-and-gun guy and Eldgrim is a quick glyph grabber with a useful Spirit. 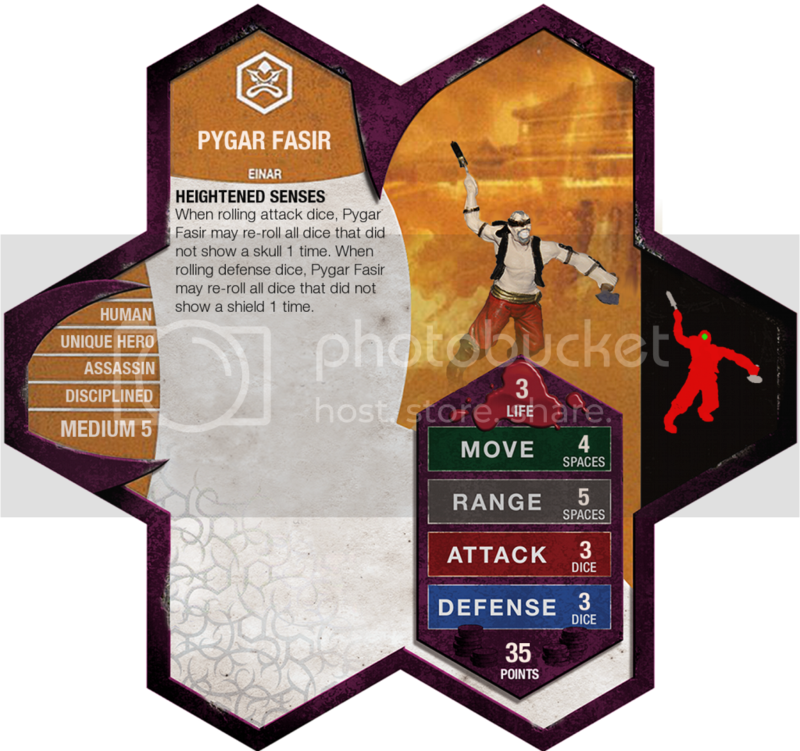 Pygar Fasir's shorter range requires him to get in closer, and Heightened Senses give him a good possibilty of a killing shot and survivability. C3V's Siiv is a better comparison. Siiv has better speed and a similarly nasty single attack. His 2 Life and 4 Defense look similar as well, just looking at the numbers. I'll leave the rest of the balance discussion up to the Playability section. The blind warrior/killer/assassin is a popular trope that has yet to make an appearance in Heroscape. Instead of focusing on the assassin aspect of the unit HcHotcakes kept the design simple and focused on his most unique aspect, his blindness. I feel that Heightened Senses captures the theme well, in a Daredevil sort of way. However, when I played him in a game with another player, he was initially unclear of the theme. He had an "Oh!" moment when I told him Pygar was blind and he liked the theme after that, but initial confusion gives me pause. I'm not convinced the card calls out his theme upon a "blind" reading (pun intentional), but then people don't know why a big robot is Merciful or why a viking has a reptilian arm without a theme explanation. I think with the figure and the power name "Heightened Senses" the theme is strong enough. The figure itself is ok. My copy has the spotty paint job I have come to expect from Clix, and why is an assassin carrying a hammer? A little touch-up work can fix the paint job, and I can live with the hammer. At the least the figure is acceptable. Like I stated before, I like the simplicity of the design, and how well it captures the unit's theme. As I said in the Balance section, Pygar Fasir is best put into the cleanup filler role. He isn't powerful enough to build an army around nor does he have specific synergies to play off of, and his price tag allows him to slip in to armies with a few points to spare. While he can kill consistently, order markers spent on a single, slow figure to gain position and make a single attack are not worth as much as bread & butter, shark, or menacer units, particularly in early or mid game. At cleanup he does his job well -- too well. A 3/3 unit with no synergies and only 3 Life does not seem like much, but do not underestimate Heightened Senses. While it's not as good as having 6 dice, it's actually somewhat close. Obviously the maximum number of skulls/shields is limited, but when attacking squaddies 2 or 3 skulls is often enough to kill and 1 or 2 shields is enough to block many attacks. Three defense dice with re-rolls is as statistically likely to block a single skull attack as 6 defense dice is. But what really makes re-roll powers frightening is boosts. I found that something as simple as height advantage could make the blind man both deadly and difficult to kill, capable of giving full squads the beatdown while deftly dodging their attacks. Other boosts such as auras and Spirits are easy enough to get as well. As a fan of the Einar Imperium, I can tell you how good re-rolls can be. Mr. Fasir does have his weak points. His slow speed is definitely a setback, especially for climbing onto height, though a threat range of 9 is still pretty good. And, like anything else, even six dice can fail to roll a shield. Charging him headlong into an army by himself will just get him killed, as is true with most units. Playtesting him alone against various units, I found him able to put up quite a fight against a single set of strong squads like the 10th Regiment of Foot. Even if he doesn't always win such matchups, he does better than 35pts would suggest. Against melee he performs at his best, as he's usually able to claim the high ground. In cleanup I found he can be especially potent; in close games, when he is most likely to be used, the enemy forces are often depleted and scattered. Pygar is quite efficient at picking off stragglers. To be fair, can I say Pygar Fasir is really better than Marcu+Isamu? I'm not sure I can, but note that both of those units come with sizable risk. Pygar is the opposite, mitigating risk with re-rolls. I like the theme, I like the simple design, and I like that Pygar is a filler hero. However, he consistently performs better than I feel a 35 point filler hero should. My impression is that he belonged in the 60-70 point range. He might be right at his current price point if his Attack/Defense were 2/2 instead of 3/3, though I admit I didn't test him that way. I believe Pygar Fasir has a place in Heroscape, but I don't think he's where he needs to be quite yet. I vote to induct Pygar Fasir into the SoV. So, of the Yuan-Ti Swiftscale singles, there are 41. My next post will be of the boxed versions. So, for the Dungeons of Dread Starter Set, there are 38. 79 is just barely enough for a Unique Hero. I will give my to this unit but I suspect it will struggle in the Unified Review, as VC as a whole likely will not want to commit to using another box. Curious, how many people ACTUALLY buy the figures?